You seem like a person with complicated thoughts. We get it. It's a complicated world out there! You get a coffee at work to stop yourself from feeling groggy and stupid. Then, when you walk back to your desk you slosh coffee all over, making yourself feel stupid in front of everybody! That'll wake you up. Even the time sequence of life is confusing. You start out stupid with plenty of energy. Then people get smarter and more aware of the world's ways. But as you're aging you get less energy. How is that fair? So instead of trying to force that frown into a fake smile, vent your energy into the grossest frown you can fathom. Better out than in, as we say! 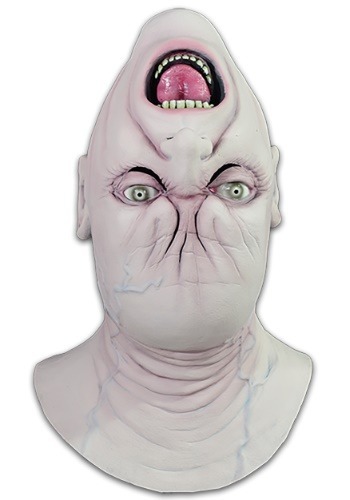 This vinyl mask has a slit in the back, letting you transform into this strange figure in full force. The skin is rife with disturbing details like blue veins, neck wrinkles, and intense wrinkles around the eyes. The eyes have a slit that you can see the world. Are you ready to send out some seriously psychologically disturbing vibes at your next Halloween party? This mask is the perfect way to go. Shake things up, turn the tables. No one will want to take a second look!